Do I have CK or Standard Wiring? Only a handful of vehicles made in certain years, from a few manufacturers use a CK wired socket. Sometimes different car and truck manufacturers will change the type of wiring configuration they’ll use to power certain turn signal and brake light bulbs. Normally you would have Positive and Negative terminals on either side of the bulb, but the “CK” type wiring is different. These 2 types of wiring configurations can be found on 3157 or 7443 types of bulbs. Some LED bulbs available will have special circuitry built into the LED bulbs that allow them to work for either type of socket. 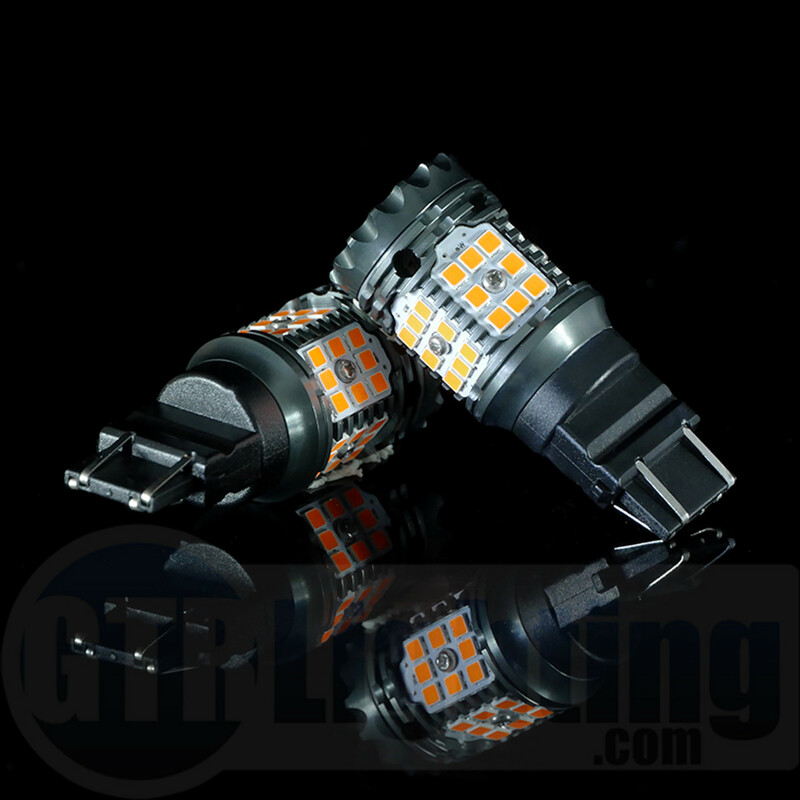 The GTR Lighting Armor Series LED bulbs work with either standard wiring or CK wiring. The GTR Lighting Carbide CANBUS LED bulbs are more specific. Withe the Carbide CANBUS bulbs you need to identify if you have the standard wiring or the CK type wiring before making your purchase. The position of the contacts in the socket is the only difference. The bulbs and the sockets look identical – the only way to know the different is to test with a multimeter! If you install a non-compatible bulb there’s a possibility it will blow the protection circuit fuse and you will have to replace the fuse and install the correct bulb. Sometimes if you use the wrong bulb it will simply not work correctly, without blowing a fuse – that depends on the vehicle. 1. Search on Google or YouTube for vehicle specific information. It is possible that someone out there has already identified if your car or truck requires a CK or a normal style bulb. If you have a more popular vehicle chances are that it’s already been figured out. We recommend you do some searching research on Google, YouTube, Vehicle-Specific Facebook groups or Vehicle-Specific website discussion forums with your year, make, model and key words like “LED”, “CK”, “C/K”, “Turn Signal Bulb”, or any other applicable key words you can think of. 2. Do your own testing! From our experiences, many TOYOTA vehicles front turn signal sockets are a CK type. Sometimes, you can even see there are two metal terminals inside the socket connected directly which means they are the shared CK-Style ground terminals. Sometimes you may be able to identify the ground terminal locations from the wires on the back of the socket. A test is still required in order to confirm the type. Also your original bulb will tell you if it is a CK or standard, most CK bulbs will say SRCK on the bulb base. To do the testing we recommend you use a digital multimeter but a test-light may also work. If you are not a qualified and trained technician we recommend that you hire one to decide which type of LED bulbs to purchase. NOTE: Remove all tail light bulbs before testing, otherwise the filament in the brake circuit will read as a “false ground”. You must test your sockets BEFORE you purchase your new GTR Lighting LED bulbs. How much lumen do LED headlight bulbs really have? There are so many different LED headlight conversion kits on the market; it’s hard to decide which one is the best. Most will specify the Lumen output on the packing; normally 4,000 Lumen, 5,000 Lumen, or 6,000 Lumen. Sometimes you’ll see some headlight bulbs marked with 8,000 Lumen, 10,000 Lumen or even 12,000 Lumen. But what is the true Lumen of a LED headlight bulb? In order to find out what’s actually true, let’s understand Lumen first. The lumen (symbol: lm) is the SI derived unit of luminous flux, a measure of the total quantity of visible light emitted by a source. We measure the lumen of a LED headlight kit within a device called an integrating sphere. A bulb is positioned in the sphere and the light given off by the bulb is scattered inside the integrating sphere and evenly distributed to 360 degrees. The total brightness amount of a source of light can be measured accurately since light could be captured from all angles in the sphere without any interference from other light sources. [Read more…] about How much lumen do LED headlight bulbs really have? Does my car have CANBUS? Modern vehicles use sophisticated electronic systems onboard to control and monitor your vehicle’s headlights. When you replace the stock incandescent light bulbs in your fog lights or headlights you might run into an issue with the vehicle’s lighting computer thinking there is a problem. Back in the old days, the headlight circuit was a simple on/off 12v switch… that is no longer the case! Some vehicles have a standalone computer specifically to control the different lighting functions on the vehicle and it’s programmed to know exactly how a standard light bulb functions. As soon as this specialized computer “sees” something that doesn’t line up with it’s programming it either puts the system into a diagnostic mode or keeps functioning and throws an error. This could happen because the new LED headlight conversion kits will “read” differently than the stock bulbs to your vehicle’s computer. If you have these symptoms consider trying a warning canceller module. It requires no extra modification, and is a simple plug and play connection between the factory vehicle wiring and your LED conversion kit wiring. When will you need a decoder? When you install LED headlights into your car and have any of the following problems., you may need a decoder. (1) Bulb flashing when turned on. (3) Bulbs stay illuminated after they are turned off. (4) Abnormally dim light output. We’ve found that Volkswagen, Ford, Jeep/Chrysler, Mercedes, and vehicles using pulse width modulation (PWM) tend to need CANBUS adaptors the most. 2019 Ram LED Headlight Bulb Buyer’s Guide – The 10 Best Bulbs for Reflector Halogen Ram Trucks! The new Ram trucks coming out today have 3 different headlight options. Reflector LED, Projector LED or Reflector Halogen. The price difference between the trim levels can be quite staggering. Up to $67,000 for a top-tier trim level and as low as $38,000 for a base model with reflector halogen headlights! If you took the more economical route, I’ve got good news for you! The headlights that come on the halogen reflector headlight housings have a lot of potential when paired with the right LED headlight bulbs! My new Ram 1500 truck! [Read more…] about 2019 Ram LED Headlight Bulb Buyer’s Guide – The 10 Best Bulbs for Reflector Halogen Ram Trucks! The Brightest Ford F350 Super Duty Truck IN THE WORLD!! This truck is equipped with the best of the best, and the absolute brightest lighting products available for the 2017-2019 Ford F350 and F250 Super Duty trucks! We first installed a lift, wheels and tires, and the Addictive Desert Designs roof and headache rack. From there we installed all the Vision X goodies possible to come up with over 100,000 Lumens of light! This thing is 100 times brighter than the average vehicle on the road… Can your truck do that? [Read more…] about The Brightest Ford F350 Super Duty Truck IN THE WORLD! !